The Philharmonic Society gratefully acknowledges the Isidore C. and Penny W. Myers Foundation Endowment Fund/ Jewish Community Foundation of Orange County for generously sponsoring the evening’s performance. (tenderly), espressivo, sempre dolce. Even the tempo indication for the first movement spells out clearly the mood Brahms wishes to project: Allegro amabile—“Fast, [but with] love.” The movement begins with a graceful, flowing melody for piano alone, its four-bar phrases always answered by the violin. The violin itself soon picks up this melody and later shares the equally-relaxed second subject with the piano. In the same year that he wrote this sonata, Brahms used this theme as the basis for his song Wie Melodien zieht es mir (“As Melodies a Feeling”), and it may be worth quoting the opening of the text of that song, for some of its spirit flavors this movement: “As melodies a feeling / steals softly through my mind, / as spring flowers it blooms / and as scent floats away.” The development is powerful, but the music remains amiable throughout, and an extended coda rises nobly to the dramatic close. this music in turn frames a haunting middle section that Schubert marks dolce. The introduction concludes with an almost timid two-note cadence: B rising to C-sharp. But this restrained figure promptly becomes the basis for the rondo itself, marked Allegro: both violin and piano hammer it out to launch the rondo, and this rising motif will figure as an important thematic element throughout. The rondo section itself combines equal parts virtuosity (busy passagework, high positions, surprising accidentals, and difficult string-crossing) with the most melting lyricism, as Schubert breaks into the bustle of this music with gentle interludes. Along the way, he brings back reminiscences of the slow introduction before a più mosso coda drives this music to its spirited close. swept away by her playing—and by her personality (Bartók was one of the many who fell in love with her). Ravel was so impressed that he stayed after the concert and talked her into playing gypsy tunes from her native Hungary for him—and he kept her there until 5 a.m. the next morning, playing for him. Tzigane probably got its start that night. Inspired by both d’Aranyi’s playing and the fiery gypsy tunes, Ravel set out to write a virtuoso showpiece for the violin based on gypsy-like melodies (the title Tzigane means simply “gypsy”). Its composition was much delayed, however, and Ravel did not complete Tzigane for another two years. Trying to preserve a distinctly Hungarian flavor, he wrote Tzigane for violin with the accompaniment of lutheal, a device which—when attached to a piano—gave the piano a jangling sound typical of the Hungarian cimbalon. The first performance, by Jelly d’Aranyi with piano accompaniment, took place in London on April 26, 1924, and later that year Ravel prepared an orchestral accompaniment. In whatever form it is heard, Tzigane remains an audience favorite. amalgam of both composers’ styles, combining Tchaikovsky’s melodic gift with Stravinsky’s ingenious rhythmic sense. First performed in Paris on November 27, 1928, The Fairy’s Kiss (as Stravinsky called the ballet) has never enjoyed the success of his other ballets, but Stravinsky retained his fondness for the music. Several years later, in the early 1930s, when Stravinsky went on concert tours with the violinist Samuel Dushkin, he needed music for the two of them to play together. He composed the Duo Concertante for Dushkin and arranged several of his orchestral scores for violin and piano to fill out these programs. One of these scores was The Fairy’s Kiss, though when Stravinsky made the violin-piano arrangement, he changed the title to the more abstract Divertimento. debut with the Orchestre National de France. He looks forward to an upcoming tour of China with the Gothenburg Symphony and Kent Nagano, and a European tour with the London Philharmonic and Christoph Eschenbach. Other highlights of the season include debuts with the Rotterdam Philharmonic, and a recital at the Amsterdam Concertgebouw. Followed by more then a million people on SoundCloud, Ray Chen looks to expand the classical music audience by increasing its appeal to the young generation via all available social media platforms. He is the first ever classical musician to be invited to write a regular blog about his life as a touring soloist for the largest Italian publishing house, RCS Rizzoli (Corriere della Sera, Gazzetta dello Sport, Max). In his unstinting efforts to break down barriers between classical music, fashion and pop culture, he is supported by Giorgio Armani and was recently featured in Vogue magazine. 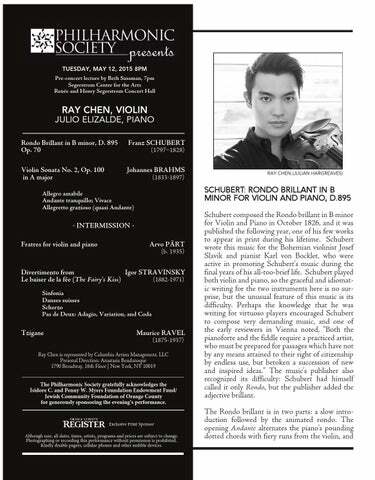 Born in Taiwan and raised in Australia, Ray was accepted to the Curtis Institute of Music at age 15, where he studied with Aaron Rosand and was supported by Young Concert Artists. He plays the 1715 “Joachim” Stradivarius violin on loan from the Nippon Music Foundation. This instrument is one of the five 1715 violins once owned by the famed Hungarian violinist, Joseph Joachim (1831-1907). jUlio ElizaldE, Piano Praised as a musician of “compelling artistry and power” by the Seattle Times, the gifted American pianist Julio Elizalde is one of the most soughtafter and multi-faceted artists of his generation. He has performed in many of the major music centers throughout the United States, Europe, and Latin America to popular and critical acclaim. 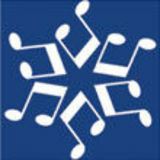 The summer of 2014 marks his third season as Co-Artistic Director of the Olympic Music Festival near Seattle, Washington. In the same year, he performed the complete cello sonatas by Beethoven in one performance with distinguished cellist Bonnie Hampton at the San Francisco Conservatory of Music. Mr. Elizalde has performed under the baton of Itzhak Perlman, Teddy Abrams, and Anne Manson. He has also worked with famed artists such as Pamela Frank, Osvaldo Golijov, Stephen Hough, William Sharp, and members of the Juilliard, Cleveland, Kronos, and Brentano string quartets. Mr. Elizalde is a member of the New Trio, with violinist Andrew Wan, co-concertmaster of L'Orchestre symphonique de MontrĂŠal, and Patrick Jee, cellist of the New York Philharmonic. The New Trio was the winner of both the Fischoff and Coleman National Chamber Music Competitions and is the recipient of the Harvard Musical Association's prestigious Arthur W. Foote Prize. As part of the New Trio, Mr. Elizalde has performed for distinguished American politicians such as President Bill Clinton, Condoleezza Rice, Henry Kissinger, and the late senator Ted Kennedy. He was a featured performer for the soundtrack of the 2013 film Jimmy P, composed by Howard Shore, Academy Award-winning composer of The Lord of the Rings. Mr. Elizalde has appeared with many of the leading artists of our time. He regularly appears as recital partner to world renowned violinists Sarah Chang and Ray Chen. In 2013, Ms. Chang and Mr. Elizalde performed at an event in New York City honoring the first official visit of South Korean President Park Geun-hye. Caramoor, Bowdoin, Kneisel Hall, and the Music Academy of the West. Mr. Elizalde was a juror for the 2012 Fischoff National Chamber Music Competition held at the University of Notre Dame in South Bend, Indiana. Originally from the San Francisco Bay Area, Mr. Elizalde received a Bachelor of Music degree with honors from the San Francisco Conservatory of Music, where he studied with Paul Hersh. He holds Masters and Doctor of Musical Arts degrees from the Juilliard School in New York City, where he studied with Jerome Lowenthal, Joseph Kalichstein, and Robert McDonald.